You don't have to go to your local grocery store to get the thrill of filling in the number bubbles on those paper tickets since now, with Lottery Sim, you can simulate the play of those same Lottery games on your mobile device. Lottery Sim is a full featured Lottery simulator and knows the rules of play for the eight most popular number-based Lotteries (see below). Choose any number of tickets for one or more of these Lottery games. Swipe between tickets and tap to bubble them in. Each ticket allows you to select the numbers, times and days of play per week, and play type (if available). Any bubbles left blank will be filled randomly at draw time. Catch a glimpse at what could happen if you play your choice of Lotteries for a week, a month, six months, a year, ten years, and even a lifetime! Watch your virtual piggy bank grow and shrink as you win and lose money throughout the simulation. Comprehensive and informative reports compare results to see which games had better returns. Use these stats to tweak your play strategy and help make the most of your Lottery experience. 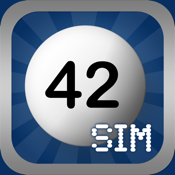 Beyond simulations, Lottery Sim also features a lucky numbers generator with a unique approach and a ticket manager to keep track of your real world plays. Bring Lottery Sim with you to your local Lottery outlet to use it as your personal ticket manager as you fill in your real world Lottery tickets. "You can't win it if you're not in it." "You can't lose it if you just SIM it." • Supports Retina display and the new larger screen iPhone 5. • Simulate playing from a single week to over a lifetime! • Configure the settings for each Lottery game, including number ranges, prizes, ticket costs, and more, to accurately recreate your local Lotteries. • Lucky numbers generator with a unique approach. As many tickets as possible are generated within a user-selectable amount of seconds, and then Lottery Sim chooses those numbers which come up the most to form your lucky ticket. You can also specify your personal lucky numbers and a lucky 'seed' word or phrase to influence your own luck. • Manage your real life plays with ticket records. Keep track of the tickets you've played, the prizes they've won, and view reports to determine which games are earning you the most money. Lottery Sim is a simulator used for entertainment purposes only. The money used in Lottery Sim is virtual. The player WILL NOT win or lose real money within Lottery Sim. Lottery Sim WILL NOT increase your chances of winning a Lottery. Lucky numbers generated DO NOT have a better chance of winning compared to numbers selected by any other means. Lottery Sim IS NOT associated with any Lottery organization. Remember to play responsibly. You must be at least 18 years old to play a real Lottery. Consult your local Lottery outlet for official rules and regulations. *Real world Lottery games are trademarks of their respective owners.